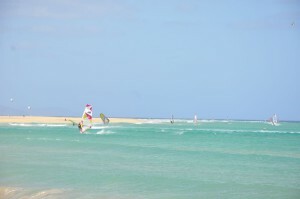 Surfing / windsurfing is one of the most popular water sports on Fuerteventura. No wonder, the island is one of the best surf spots in the world as there are always good winds and countless coasts and cliffs. If you have ever wanted to try surfing or windsurfing then this is the place for you. There are some really good surf schools on Fuerteventura that offer all sorts of courses, from the beginner to the pro course you can book everything here. The flagship and one of the first surfing and kite surfing schools is owned of course by surfing pro Rene Egli, who opened his first school in 1984 and brought the first PBA Windsurf Speed World Championship to Fuerteventura in 1986. Since then, tens of thousands people come to the island to surf each year. We work closely together with the surf school “HomeGrown” in Corralejo, which has been teaching Surfing to the people on Fuerteventura for 15 years. The school goes surfing every day (including Sundays) and offers different levels. Depending on which knowledge already exists. The weekly course costs 215 €. It includes 6 days of surfing (5 hours per day) including transport to the beach and rental equipment. The rate for theone-day-course is 45 €. Surfer can buy of course everything that the surfer heart desires in the in-house surf shop! If you are interested, just contact us and we recommend a surf school where you get a 5% special discount. And those who already know how to surf, do not forget the surfboard.